Demonstrators chanted during a meeting of the Mystic Valley Regional Charter School Board on May 21, 2017, in support of students who had been disciplined for their hair style. The steady stream of unflattering news, which seems to portray a movement in a tailspin, comes as charter schools are trying to recover from a crushing defeat in November 2016, when state voters overwhelmingly rejected a ballot question to accelerate charter expansion. Paul Reville, a former state education secretary, expressed optimism that charters would rebound and noted that traditional schools also deal periodically with controversies. Charter schools, he said, need to focus on what they do best: improving student performance. “It’s not a question of whether charters should abandon the field and go home,” he said. Still, the atmosphere has become so charged that any proposal tied to charter schools appears to be almost radioactive. The Boston schools last month abruptly turned away an entreaty by Conservatory Lab Charter School to join the system. In the fall, Mayor Martin J. Walsh, who describes himself as a charter school supporter, dropped a proposal to unify the registration process for traditional and charter schools amid heated opposition from parents. And for the past year, Governor Charlie Baker has failed to gain legislative approval to create “innovation zones” in which a select group of schools within a district would gain charter-school-like flexibility to extend school days and get around other teacher contract provisions. Teachers unions have strongly opposed the measure. Meanwhile, school and local elected officials, including Walsh, have been calling on the state to change the way it funds charter schools, saying the current method of redirecting per-pupil education aid to charters is robbing traditional schools of the money they need to thrive. Yet one area of the charter-school movement remains strong: parental demand. So far this year in Boston, about 9,246 students have filed 35,388 applications at the city’s 16 charter schools, the same level as last year. “Yes, there are some challenges here and there, but we are still delivering a high-quality education to kids every day,” said Tim Nicolette, executive director of the Massachusetts Charter Public School Association. Even Mystic Valley Regional Charter School, where the braided-hair extension dispute arose, experienced robust demand, receiving 1,400 applications. About 800 parents turned out for the annual school enrollment lottery last Thursday night. “It is abundantly clear that the parental demand for the overwhelmingly excellent educational product that charter schools like Mystic Valley deliver to children from all ethnic, cultural, and socioeconomic backgrounds has remained strong despite the controversies that have erupted over the last year,” Alexander J. Dan, the school’s director/superintendent, said in a statement. The state last month renewed the school’s operating license for another five years and said it met the criteria for “equity and access.” That action came less than a year after Attorney General Maura Healey ordered the school to immediately stop punishing minority students for wearing certain hairstyles, ruling the school’s dress code was discriminatory and unevenly enforced. The state Education Department would not provide documents about its decision. So far this year in Boston, about 9,246 students have filed 35,388 applications at the city’s 16 charter schools. Charter schools bet heavily in 2016 that voters would embrace the ballot initiative to rapidly expand such options. Currently, state law caps how much communities can spend on charter school tuition, limiting student enrollment. Polls initially indicated the bet would pay off. Charter schools had benefited over the years from a wealth of research that showed they were achieving better results than district schools and from news coverage that highlighted MCAS success. But public opinion shifted dramatically as teachers unions and parents of students in traditional schools pounded the theme of potentially dire financial consequences of opening more charters, which they said would cause massive budget cuts. In the end, nearly every community voted the measure down, often by lopsided margins. Then, last September, the campaign came back to haunt charter advocates. The Massachusetts Office of Campaign and Political Finance determined a pro-charter group that poured $15 million into the campaign, Families for Excellent Schools-Advocacy, illegally hid its donors. State regulators levied the highest fine in state history, $426,466, against the group and revealed its donors, an embarrassing episode for the Baker administration. Among the contributors was Paul Sagan, chairman of the Massachusetts Board of Elementary and Secondary Education, which prompted charter school critics to call, unsuccessfully, for his resignation. With the reputation of charter schools bruised, critics are taking every opportunity to curb growth. While Boston and a few other systems are near or at their state-imposed caps, many others have room for more charters. 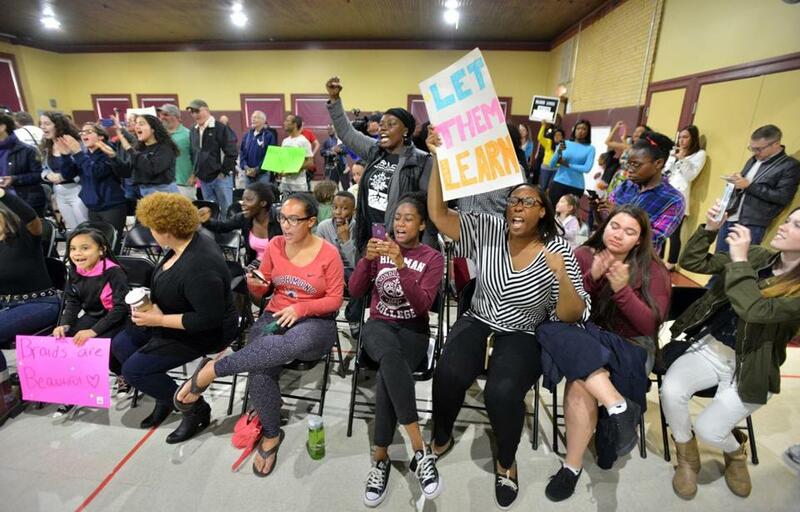 Opponents declared success last week after state education officials rejected two charter school proposals for Lynn but expressed disappointment that officials approved expanding a charter school in Springfield and opening another in Lawrence. “It’s astonishing that . . . big charter corporations are still coming into our communities trying to expand their private schools against the will of the people,” Kelly LaPierre, a teacher and parent in Lynn, said in a statement. Not everyone shared that view. Nearly three dozen parents and staffers from KIPP Academy Lynn, which had pitched an expansion proposal state officials nixed, packed last week’s state Board of Elementary and Secondary Education meeting to voice frustration. “Parents deserve to have options, and kids deserve every chance to be all they can be,” said Natasha Megie-Maddrey, a KIPP parent. Critics also have been waging battle against any proposal that seems charter-like, such as innovation zones. Paul Grogan, president of the Boston Foundation, which has funded charter-school initiatives, said it was unfortunate that critics are targeting innovation zones. He said many urban systems desperately need radical change to boost student performance. “Given the outstanding performance of charter schools, we have to keep them in business so they can continue their great work,” he said. Walsh said he would welcome the help of charter schools in that effort. He said his criticism about the city losing $195 million to charter schools next year is not about dissatisfaction with those schools but with the state not living up to its funding commitments.